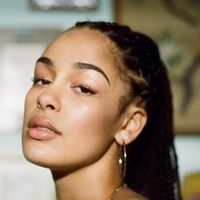 It all started in January 2016, when Jorja Smith uploaded “Blue Lights” to Soundcloud, her self-released debut single. Since the age of 16, she’d been writing stories through music. Stories of observation, love, and anger. The stories that are unfolding around us all everyday, but that most of us are too distracted to notice. “Blue Lights” was one of those. Written after watching Dizzee Rascal music videos while taking a break from her A-Level dissertation (titled: “Is Postcolonialism Still Present in Grime Music”) the song was inspired by the hostile situations innocent young black men were facing every day, not just in her local town of Walsall but around the world. The song blew up, earning the praise of Skrillex and Stormzy, before it was eventually included on Drake’s OVO radio show. Since then, Jorja has gone on to create a name for herself as a gifted young R&B songwriter with a masterful knack for crafting melodies that make you feel like you could be anywhere from a smoky Parisian jazz club to a North London warehouse party. Her debut EP, Project 11, was a flowing collection of songs knitted together by the soulful elasticity of her voice. Earlier this year, she came fourth in BBC’s Sound of 2017, and has already been nominated for a MOBO. And while most teenagers in London are spending their commutes to work listening to Drake, Jorja’s in there collaborating with the Toronto megastar on “Get It Together”, featuring on his More Life project, and performing as a special guest at his UK headline shows. All this for a girl who’s only just turned 20, and hasn’t even released her debut album. Jorja grew up in the industrial West Midlands town of Walsall. Both of her parents were musical, and BBC Radio 1Xtra was constantly playing in the kitchen, blasting out bassline classics like T2’s “Heartbroken” as she did her homework. Little did she know that ten years later she’d be performing live on the station, as the special live performer for Trevor Nelson’s last ever ‘Live Lounge’. Encouraged by her parents, she started playing keyboard at the age of 8, and was learning to sing classical by secondary school. It’s something that still influences her now, and you can hear it in the vast range of her voice or in certain moments like the choral opening harmonies of “Something in the Way”. Summers as a teenager were spent floating around town in her friends’ cars, her fragmented memories of it permeated by the sounds of Frank Ocean’s Channel Orange and Chance The Rapper’s Acid Rap, which would always been drifting through the car stereo. From the backseat, she’d listen to her friends talk about boyfriends and girlfriends, sweet nothings and broken hearts, and cultivate them into ideas for songs. All of the songs that would make it onto her debut EP were written during these adolescent years. She was intrigued by London, her ideas of it coloured by the lyrics of Lily Allen’s “LDN” which painted the city as some sort of bittersweet wonderland. She met her manager at 16 after he saw videos of her performing covers on YouTube, and soon she started making regular trips to the capital to meet him and work in the studio with Maverick Sabre and Ed Thomas. She eventually made the move permanent, transferring her job at Starbucks in Walsall to London, and bunking in the spare room of her aunt and uncle’s. She’d be on the bus at 5am each day for her morning shifts at Starbucks, crossing Waterloo bridge and looking out at the city in the hours before the sun rose, LP1 by fka Twigs playing in her headphones. “Beautiful Little Fools” (which was released on International Women’s Day) is a perfect example of this. It’s inspired by a quote from F Scott Fitzgerald’s The Great Gatsby: “I hope she’ll be a fool—that’s the best thing a girl can be in this world, a beautiful little fool.” The song explores the ways in which expectations of women are shaped not by women themselves but by the demands of society and the media. It’s a piece of music that is as tender as it is a rally cry. But not every song is as philosophical. She’s young, and sometimes she just wants to have fun and make something she, and maybe even her cousins, can dance to. “On My Mind”, featuring production from Birmingham’s Preditah, is just that: a garage-inflected club number that comes with a video featuring cult UK comedy crew Kurupt FM. In 2017 she has completed a US headline tour, joined Bruno Mars on his US tour, and has finished writing her debut album. Featuring songs mostly written between the ages of 16-18, it’s a youthful exploration of love and anger, but also an album about self-discovery. She won’t be putting it out until 2018, though. Why? “Because I’m not in a rush. I’ve never rushed anything in my life.” After all, she’s still entirely independent, controlling every part of her artistic identity, from music video to artwork to release schedules.